Critical distance methods are extremely useful for predicting fracture and fatigue in engineering components. They also represent an important development in the theory of fracture mechanics. Despite being in use for over fifty years in some fields, there has never been a book about these methods – until now. So why now? Because the increasing use of computer-aided stress analysis (by FEA and other techniques) has made these methods extremely easy to use in practical situations. This is turn has prompted researchers to re-examine the underlying theory with renewed interest. The Theory of Critical Distances begins with a general introduction to the phenomena of mechanical failure in materials: a basic understanding of solid mechanics and materials engineering is assumed, though appropriate introductory references are provided where necessary. 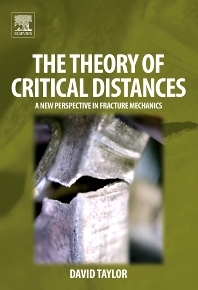 After a simple explanation of how to use critical distance methods, and a more detailed exposition of the methods including their history and classification, the book continues by showing examples of how critical distance approaches can be applied to predict fracture and fatigue in different classes of materials. Subsequent chapters include some more complex theoretical areas, such as multiaxial loading and contact problems, and a range of practical examples using case studies of real engineering components taken from the author’s own consultancy work. The Theory of Critical Distances will be of interest to a range of readers, from academic researchers concerned with the theoretical basis of the subject, to industrial engineers who wish to incorporate the method into modern computer-aided design and analysis. This book is suitable for academics and research students in universities and design engineers in companies manufacturing any type of mechanical components (cars, aircraft, chairs, washing machines). It is also suitable for students taking undergraduate and postgraduate courses in fracture mechanics and failure analysis. David Taylor, Associate Professor in Materials Engineering at Trinity College Dublin, has thirty years' experience in the field of material failure. His activities include fundamental research in the fields of fracture mechanics and biomechanics, and consultancy work on industrial design and forensic failure analysis.